I have a confession: Coming into college four years ago, I thought I knew an awful lot about dating and relationships and how to do it exactly right. I had read Christian relationship books to the extent that it was almost a hobby – I was determined to know what to do and how to do it right and not ever be hurt, and I maybe had a formula for the way I expected things to work out. And then God smashed my formula. I realized that there were some ideas I picked up from those well-meaning books and articles that were just unhelpful and needed to be unlearned. Please don’t get me wrong here: I did find wisdom from those authors, and am so grateful for what I learned. And I don’t even know if they said these ideas outright, or whether I just latched onto a phrase, interpreted it wrong, and clung to it as a lifesaver. But now that I’ve been dating for over a year, and have a fair bit of experience with relationships-that-didn’t-go-anywhere, I thought it would be fun to tell you some of the things I’ve learned. Myth: The ideal formula is to guard your heart so well that the first guy you date is your husband. Voila, heartache avoided. Reality: This one crashed around me when I realized that I don’t have to date to have my heart hurt. That came by simply being open enough to risk caring for someone. Secondly, while God doesn’t want us to be reckless with our hearts, and doesn’t like to see any of His children hurt, He uses it and that pain can be an incredible blessing (it was for me). And sometimes, it is His plan for people to date/court for a specific time or season, and then end it. Both have learned and grown through the process, and it can be good and a blessing for both parties even if that relationship doesn’t end in marriage. And that’s my prayer for the relationship I’m in now: We’re not sure what the outcome will be, but I can already say that it’s been an absolute gift and I’ve been blessed by it and grown through it. And that is both God-honoring and successful, even if we decide that we are not meant to be together in marriage and move on. Piggybacking Myth: “Guarding your heart” = you don’t really like anyone, or get to know anyone, before the guy you end up marrying. Reality: This one has a few parts to it. First, God made us to be attracted to guys. And that is a good thing. And it is completely okay. I don’t recommend really nursing or indulging in a crush, because that may not always be the best thing and it’s a terrific time waster – but recognizing that God made this person with such great qualities, thanking Him for them, and even admitting that you like this person is not wrong. More importantly, “guarding your heart” does not mean “don’t let anyone in.” It’s a bit of a messy phrase to decipher and deserves an article of its own, but here is what I believe it does mean: It does mean being wise with how much of yourself you share, and with whom. It does mean being able to rest in Christ and invite others into your life, including guys. And it especially means knowing your identity in Christ (for example, John 1:12-13) – being so secure in Him that if a relationship doesn’t work out, your heart may be bruised but not broken. Not because you’ve withheld yourself, your heart or your love from that relationship, and not because you refused to risk, but because Christ is simply greater. And you haven’t been putting the pressure of your entire identity and security on a poor guy liking you. Reality: I didn’t actually subscribe to this idea, but I have heard it so much, and it’s a bit paralyzing. My opinion is you shouldn’t date until you know he has the characteristics you’re looking for (like Gal. 5:22-23). Basically, don’t date someone you couldn’t ever see yourself marrying because of a fundamental difference (like, he’s not a sincere Christian). The little differences could easily work themselves out in the future, so don’t worry about them from the beginning. And I have heard stories of God working in people’s hearts and occasionally telling them who their spouse will be before they court/date: but that seems to be very rare. More commonly, He works through the relationship, as you grow closer to Him and each other and lean upon wisdom from parents, mentors, and others in your life. Don’t put that pressure on yourself at the beginning. But beyond those myths – all caused by that “date only one person” idea – what have I been learning? I’ve been learning that being scared of potential hurt does not lead to a good relationship and does not show trust in God for whatever the outcome is. Hiding myself and only showing my boyfriend the “Disney Princess Megan” didn’t actually give him any opportunity to know the real me and care for the real me, although it was a terrific test of his patience. But regardless of who I marry, that’s a horrible communication pattern to take into marriage. Open and honest communication is so very important, and something I struggled with. It’s fine to continue to be wise, and not share things that are too deep for your commitment level – but it’s also important to continue to open up as the relationship progresses, and not be ruled by fear. And finally, regardless of how utterly amazing your man is, it’s still a relationship with two sinners (Rom. 3:23). You will hurt each other and fail each other and never meet all of the other person’s needs. Grace covers all of that, and that’s why we have a God who fills us up like nothing and no one else. A relationship can’t handle the pressure to fulfill you: only God can. I’d love to hear from you: do you agree/disagree with this? What have you learned? What are some more of your questions? I loved this Megan! So very liberating, and full of what I have been learning too. 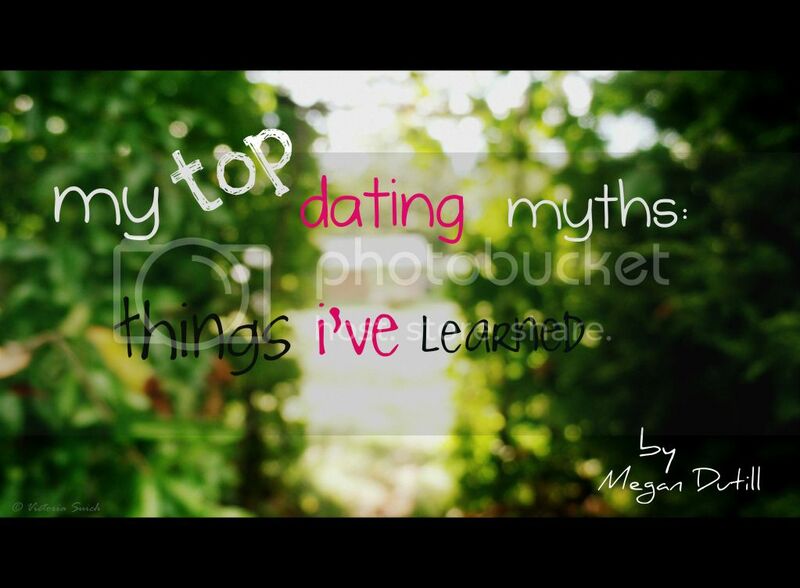 I especially like how you handled the "Only date one person and marry him myth." I know a girl who clung so tightly to these rules that she married the only guy she'd ever 'dated' because that was the way it was supposed to be-- and they didn't even really like each other. What freedom when we let go of our self-made rules and legalism, and seek Him in Word and Prayer! Thank you, thank you, THANK YOU for this post! I've read a lot of Christian dating books and learned a lot from them, but I felt a little trapped by some of these myths, too. I've actually felt guilty before for having a crush on a guy because I didn't think he was "the one." And of course, there was always the question, "If I can't get to know a guy without knowing he's the one, how will I know he's the one?!" You explained all of this so clearly and realistically. I feel really encouraged, and a lot freer now. I'm going to print your post and keep it in my diary to refer back to!